I love chocolate. So does my daughter. Finding foods that our kids will love that will also love them is tough. They are going to come across a whole range of foods in their social lives and we want to equip them to make good choices. Helps detoxification and contains powerful anti-oxidants. Gives a gentle euphoric feeling without the sugar crash afterwards. 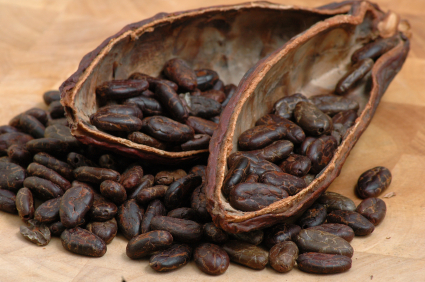 It’s what we do to the cacao and add to it that give “chocolate” the opposite list of effects. Raw Cacao is incredibly bitter to those more used to even dark chocolate so start by replacing milk chocolate with 70% dark chocolate and work your way towards using the raw cacao powder as your hot chocolate. 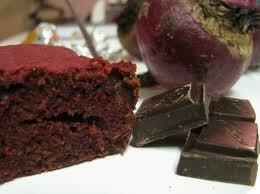 If you find nibs pair them with a Goji berry or a raisin and you are close to ‘chocolate’ flavour as we know it. Try it yourself and with your kids. 10 tries are enough to convince your taste buds! 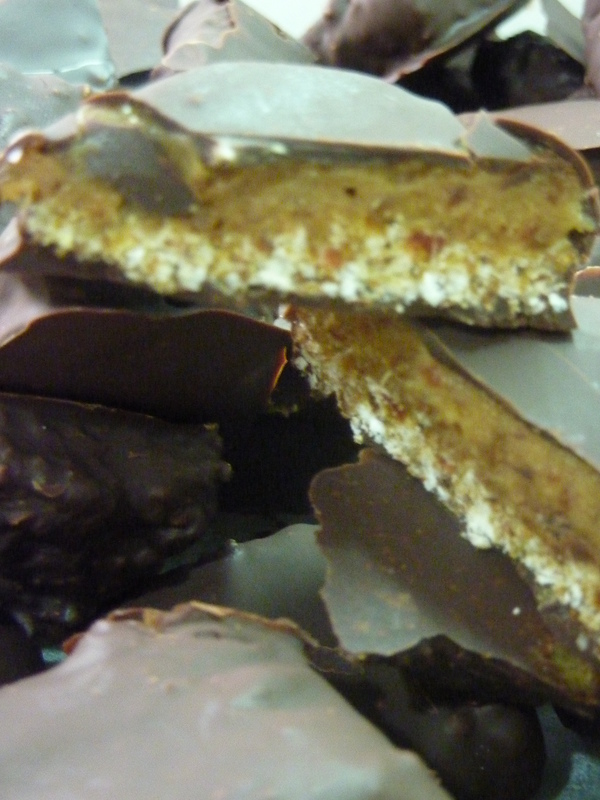 Pairing coconut with chocolate is a match made in taste and nutrient heaven- healthy Bounty bars!. Coconuts are anti bacterial, anti microbial, naturally sweet, packed with vitamins, essential fats and amino acids and minerals too. This recipe is a massive favourite in our house- a brilliant way to be able to say yes guilt free and isn’t that what we all want? I hope it will be in yours too. My friend came up with it so it is named for her! Technically some of the chocolate I have used is not dairy free but that’s just for the outside so not really necessary. Add more cacao to your ‘Elixir of Life’ to make it really rich. 1 can of coconut milk- I tried the whole put it in the fridge for it to separate and it didn’t so I just used the whole can! So I wizzed this up and refrigerated it thinking it may get solid and it went at best chocolate moose! So because these have got an airplane ride to get through I had to thicken it to ball it up somehow! That’s where the nuts come in! If you are using whole almonds blix them up till just before it hits almond butter. So they are ground and getting sticky. Add the banana and mash with a fork, add the rest I the ingredients to taste and leave the coconut flour to turn it into a bit more dough like. Roll into balls and place in freezer. Next day roll in milk chocolate (or to keep dairy free ground almond and cacao powder). This one needs less flour as its less wet. But add, mix and taste as you go. Ball up, freeze. I rolled these in 85% dark chocolate with a little coconut oil mixed in. Second verse- same as the first. Whizz hazelnuts and cranberries together. Mix everything else leaving coconut flour till end to soak up extra moisture ready to ball up. Rolled in raw cacao powder. So as before whizz the nuts and in a bowl with the mana, Elixir, then add the other ingredients except the fresh raspberries. The raspberry essence should be used sparingly as it just makes the taste of the fresh raspberry pop! Add the coconut flour to soak up excess moisture. Add a little at a time. Ball, freeze. White chocolate is hard to melt- excessive heat makes it thicker so take off the heat and stir and return. Take your time, have patience (what I keep telling my daughter possibly as I constantly need to hear it myself! Now I have made marzipan before but since it contains raw eggs I didn’t feel comfortable making it for other people to consume in a weeks time so I bought it. In an ideal world I would have searched for an egg free recipe and if anyone has one please share it with me. Handful of glacé cherries, mixed peel, dried cranberries and raisins soaked at least overnight in Tokay. Also below is where I got some inspiration and sound good too. My journey began with foods I have never heard of till now. I have a dehydrator at home inherited from my folks who bought it to dry fruit and never used it! So I am looking into incorporating raw foods into our day to day diet to try and completely erradicate industry processed foods. A tough thing to do it seems! Anyway- Buckwheaties are first on the agenda- apparently you can buy these ready made- but where’s the fun in that?! Also nowaday buying something made isnt as simple as making something and putting it in a bag to give to someone else. Right now to the twix- this then takes no time at all! Put the buckwheaties, dates and sugar in a food processor. I had to use a mini chopper as my Kenwood mixer food processor didnt have a good enough seal for the crumbs to stay in. Blitz until crumbs but may be some big bits still- keeps it crunchy and biscuit like. Add the cocoa butter and mix till its evenly mixed through. Put some cling film in a baking dish- I used a square silicon one. Press down so bottom is evenly covered by the base. Put in the freezer. While this is freezing make the caramel. Blend these all together and take out the biscuit base and smooth over the top. Put back in the freezer for a few hours. When it’s set and frozen. Melt 200g of quality organic/ fair trade min 70% dark chocolate. I used endangered species (I think 1 milk chocolate bar and 1 dark will make it taste less overwhelmingly chocolate and more authentic to the Twix bar). In a Bain Marie. Take out base and caramel from freezer and lift out of bakeware onto a chopping board. I cut it into 1 inch squares. Get some baking parchment to put them on. Roll around using 2 forks in the chocolate till covered and lift out and put on the baking parchment. When finished put in the fridge for a couple of hours to set- or the freezer. And Voilà- try don’t taste exactly the same- they taste better! Don’t forget to put the excess chocolate in a parchment to make caramel biscuit chocolate bar after!!!! Reward your self with one or two with a cup of Chai roobios!! Thanks to these two ladies- without which this would never come into existence for me! I love bounty bars- but now they just seem way too sweet. I found these bars called ‘coconut secret’ they are delicious but I could only eat half at a time and they are super pricey to eat regularly. Lucky for me my great friend Kate loved them enough too to play with the ingredients and come up with a recipe! Little tweaks to make them mine (I’m awful at following a recipe!!) I wanted to make them truffle size as I can then just eat the one- and I’m making truffles for Christmas. 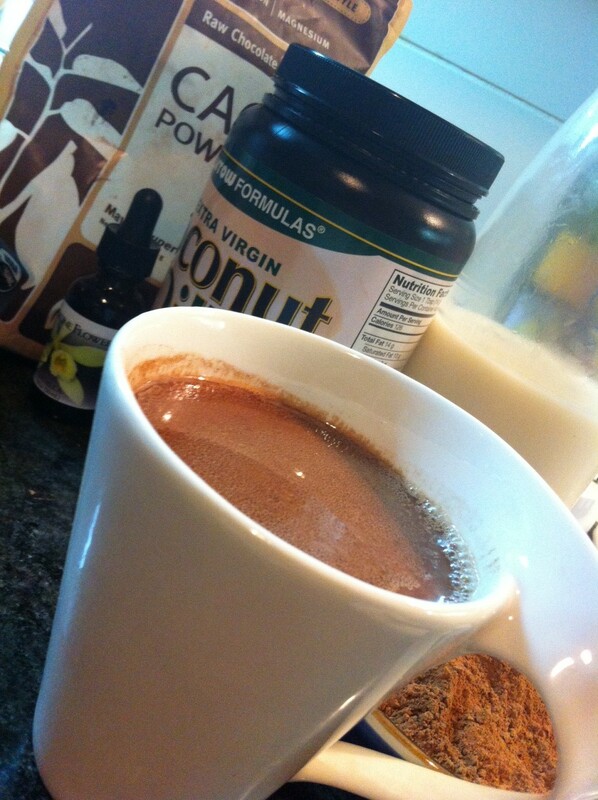 3tbs coconut manna (butter) This makes it gooey, you could also use peanut or other nut butters or cocoa butter. Mix desiccated coconut, coconut manna (butter), a few tablespoons of coconut nectar (to taste) and coconut oil and salt in a bowl. It should make a sticky sort of mixture that will cling together when you press it. It may take more or less of the ingredients above. 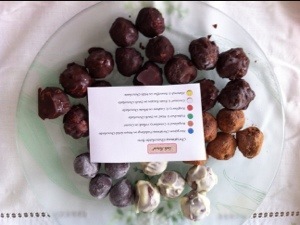 Make into balls chocolate truffle size. Place on grease proof paper and put in the freezer. Wait at least an hour. 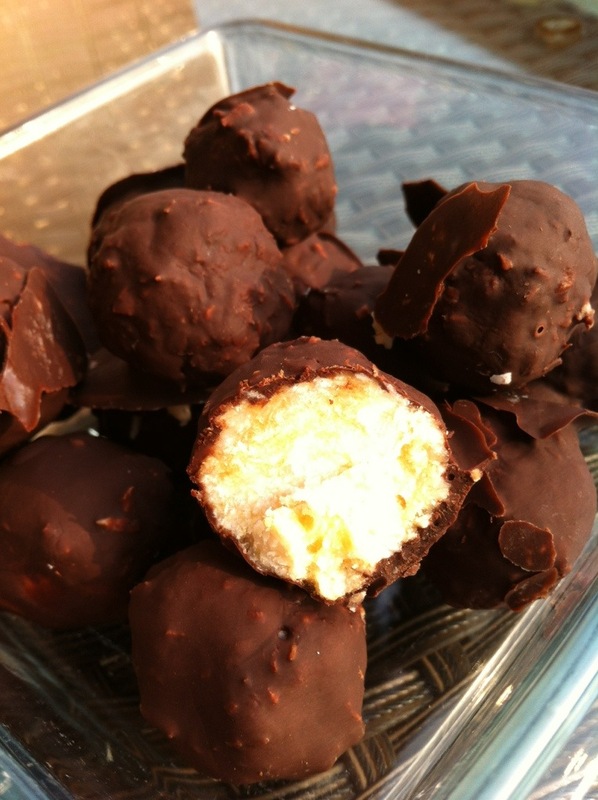 Melt chocolate with coconut oil over a ‘bain marie’. Use fork to drop coconut balls into chocolate, completely cover and then bring out and put back on the grease proof paper. The temperature of the balls will help the chocolate to set quicker. Refrigerate again until set (about an hour). You could also just roll these in Raw Cacao powder if you want them truly raw. If there is any chocolate left, pour onto another piece of greaseproof paper and allow to reset into a chocolate bar- lovely with bits of coconut in it! !